Photo: Floyd County Courthouse, ca. 1892, 5th Avenue and Tribune Streets, Rome, GA. Listed on the National Register of Historic Places in 1980. Photographed by user:David Edward Hope (own work), 2012, [cc-by-3.0 (creativecommons.org/licenses/by/3.0)], via Wikimedia Commons, accessed May, 2013. Floyd County administrative offices are located at 12 East 4th Avenue, Rome, GA 30162; phone: 706-291-5110. 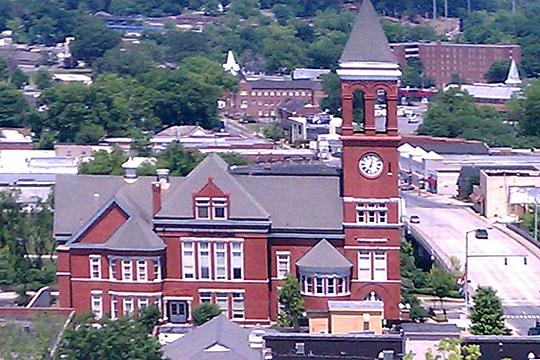 Established in 1832, the county is named for John Floyd [1769-1839], a Brigadier General in the Georgia Militia [1813-1815] who also served as a Georgia congressman [820-1827] and a U. S. congressman [1827-1829].